Bored of the Colour of Your Wheels, Why Not Change The Colour? At DJ Auto Body Repairs we don't just paint the face of the alloy wheels, we Powder coat them inside and out just like the original factory process. Alloy wheels are proving to be a must have accessory whether you car is new, old or vintage. Although in appearance they are appealing, they are more susceptible to potholes and kerb damage. We can transform the appearance of your alloy wheels and offer refurbishment at an affordable cost. There are a variety of colour options including Gloss Black, White, Gold, Various Anthracite Shades, Hyper Silvers etc. If you have a colour in mind that is not mentioned above, as long as we are able to obtain the paint code we can mix it. In the past we have even been asked for extraordinary colours such as Orange and Pink, so if there is a Ford or Fiat body colour for example that you like, we can mix it. Please don’t be afraid to be different! (Please note that it is the customer's responsibility to ensure they pick the correct colour choice). We guarantee a quick turnaround and a quality finish at a reasonanle cost. Through our team of highly trained repair technicians, we will provide a professional hassle free and cost effective remedy to bring your alloys back to their former glory. Please note that this process can take between 1 to 2 days to complete. 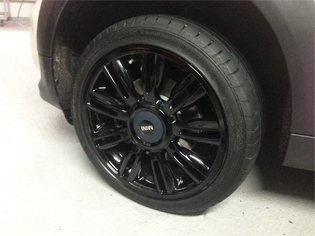 Why should you use us to repair and colour change your alloy wheels to new? We are absolutely determined to provide the best possible powder coat repair service in Manchester.